For other uses, see Evesham (disambiguation). 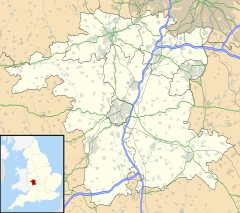 Evesham (/ˈiːv(ɪ)ʃəm, ˈiːsəm/) is a market town and parish in the Wychavon district of Worcestershire, southern England with a population of 23,576, according to the 2011 census. It is located roughly equidistant between Worcester, Cheltenham and Stratford-upon-Avon. It lies within the Vale of Evesham, an area comprising the flood plain of the River Avon, which has been renowned for market gardening. The town centre, situated within a meander of the river, is regularly subject to flooding. The 2007 floods were the most severe in recorded history. The town was founded around an 8th-century abbey, one of the largest in Europe, which was destroyed during the Dissolution of the Monasteries, with only Abbot Lichfield's Bell Tower remaining. During the 13th century, one of the two main battles of England's Second Barons' War took place near the town, marking the victory of Prince Edward who later became King Edward I. The Market Place in Evesham, circa 1904 by Edmund Hort New. Evesham is derived from the Old English homme or ham, and Eof, the name of a swineherd in the service of Egwin, third bishop of Worcester. It was originally named Homme or Haum and recorded as Eveshomme in 709 and Evesham in 1086. The second part of the name (homme or ham) typically only signifies a home or dwelling, but in Worcestershire and Gloucestershire was commonly applied to land on the sides of a river, generally in bends of a river, which were liable to flood. It is impossible that Eoves should have been the Swineherd's name for several reasons. In the first place the letter 'V' is not found in the Saxon alphabet, having been brought to this country by the Normans; so that Eofeshamme, given in one of the charters, indicates the older and better form of the name... But even if Eofes is older and more accurate than Eoves it cannot be the original form of the name. A moment's reflection will show that if Evesham means the meadow of some person, the name of that person must be in what Grammarians call the Genitive (or Possessive) Case, Singular. This in modern English is nearly always denoted by 's placed at the end of the word; the apostrophe showing that a vowel has dropped out of the termination. Anglo-Saxon had a larger selection of endings for the Genitive Case, but the one in –es (the original form of our modern 's) belonged to what are called 'strong' Masculine nouns, which usually ended in a consonant. Eofes, therefore, would be the natural Genitive of a man's proper name, Eof. Ferguson suggests that the original form of the name might have been Eofa, but such a name would correspond to the 'weak' nouns which made their Genitive by adding not –es but –an; in which case the name of the town would have been Eofanham, as is shown in the case of Offenham, the Ham of Offa or Uffa. We may therefore take it as certain that the real name of the Swineherd was not Eoves, Eofes, or even Eofa, but Eof. And this is not a mere theoretical reconstruction, for Eof was actually a Saxon name... The form Eoves, though current for many centuries, is a mere blunder. Evesham Abbey, which became possibly the third largest in England, was founded by Saint Egwin, the third Bishop of Worcester, in around 701 AD, following the vision of the Virgin Mary to a local swineherd or shepherd named Eof. An entry in the Great Domesday Book of 1086 lists Evesham, mentioning "Two free men; Two radmen; Abbey of St Mary of Evesham; Abbey of St Mary of Pershore; Edmund, Abbot of St Mary of Pershore; Walter, Abbot of St Mary of Evesham; Aethelwig, Abbot of St Mary of Evesham; King William as donor; Odo, Bishop of Bayeux; Ranulph; Turstin, Abbot of St Mary of Pershore; Walter Ponther; Westminster, Gilbert Crispin, Abbot of St Peter." The abbey was redeveloped and extended after the Norman Conquest, employing many tradesmen and significantly contributing to the growth of Evesham. Income for the abbey came from pilgrims to the abbey to celebrate the vision and visitors to the tomb of Simon de Montfort. As a result of Henry VIII's dissolution of the monasteries, Evesham Abbey was dismantled in 1540 and sold as building stone, leaving little but the Lichfield Bell Tower. The abbey remains are a Scheduled Ancient Monument (No. WT253), and parts of the abbey complex, Abbot Reginald's Wall (registered monument) and the ruins of Abbot Chryton's Wall (Grade II), are English Heritage listed buildings. The abbey's coat of arms is used as the crest of Prince Henry's High School. Two surviving buildings with links to the abbey are the Middle Littleton Tythe Barn and the Almonry Museum and Heritage Centre, which is housed in the old almonry of the abbey and also displays artifacts from excavations there. Following the Battle of Lewes a year earlier, where Simon de Montfort had gained control of parliament, the Battle of Evesham in August 1265 was the second of two main battles of the Second Barons' War. It marked the victory of Prince Edward, who led the 8,000 strong army of his father Henry III, over the 6,000 men of de Montfort, and the beginning of the end of the rebellion. The battle was a massacre; de Montfort's army were trapped in the horseshoe bend of the river, Although Simon de Montfort and his son were killed, Prince Edward's victory was not decisive towards the King's hold on the country, and the struggle continued until 1267, after which the kingdom returned to a period of unity and progress that was to last until the early 1290s. It is believed that the Battle of Evesham was the first time that the St George's flag was used to officially represent England. The medieval town developed within the meander of the River Avon, while Bengeworth developed to the east on the opposite bank of the river. In 1055 a market was granted to the Saxon town by King Edward. In the 11th century Leofric, Earl of Mercia, had a hunting lodge at Bengeworth. Leofric founded Holy Trinity Church with his wife Godifu (Lady Godiva). Godifu, who died in about 1067, is possibly buried at the abbey. During the reign of King Stephen, William de Beauchamp erected an adulterine castle at Bengeworth, whose occupants vied for control of the town and abbey. When Abbot William had the castle destroyed between 1149 and 1159, he consecrated the site as a graveyard to prevent the castle being rebuilt. Evesham was a borough and market town in the hundred of Blackenhurst in county of Worcestershire and after 1837 head of the Evesham Poor Law Union which took responsibility for the administration and funding of the Poor Law, and built a workhouse for that area. Evesham is a town and civil parish governed at the lowest tier of local government by Evesham Town Council, part of the Wychavon District of the County of Worcestershire. Residents in the six council electoral wards are represented by 24 elected members. The wards, based on streets, are represented by elected councillors: Avon (3), Bengworth (5), Great Hampton (3), Little Hampton (5), South (5), Twyford (3). The council is chaired by a mayor, and has a Town Clerk who acts as chief officer. Evesham is situated on a horse shoe shaped peninsula almost completely surrounded by water in a meander of the River Avon between Stratford-on-Avon and Tewkesbury. The modern town encompasses Bengeworth and Greater and Little Hampton, which were originally independent villages on the opposite bank of the river. Evesham is linked to Bengeworth by Workman Bridge and Hampton by Abbey Bridge, or New Bridge the first completely structural concrete bridge in the country. The Cotswold hills stretch from the east to the south-west, while to the west the area is bounded by the Malvern Hills. To the north the land is flat with gentle undulations. The Avon, a tributary of the River Severn, is navigable but mainly used by leisure traffic and there is a marina providing moorings. The River Avon at Evesham has always been susceptible to heavy flooding which is well documented from the 13th century. In May 1924 floods at Evesham ranked 5th in the annual flood list 1848 to 1935. In May 1998, Evesham was one of the towns worst hit by record flooding along the River Avon. The river rose 19 feet (5.8 m) in just a few hours, sinking tethered narrowboats, flooding areas of Bengeworth, and threatening the 19th century Workman Bridge as static homes from a riverside caravan site broke up and became wedged in its arches. In July 2007 Evesham had its heaviest rainfall for 200 years, reaching more than 320% the average in some areas. In the Severn catchment, it caused some of the heaviest floods recorded, and in Evesham the flooding was the worst in its recorded history. At the 2001 UK census, Evesham had a total population of 22,304. For every 100 females, there were 96.7 males. The average household size was 2.3. Of those aged 16–74 in Evesham, 57.5% had no academic qualifications or one General Certificate of Secondary Education (GCSE), above the figures for all of the Wychavon district (44.2%) and England (45.5%). According to the census, 2.4% were unemployed and 9.4% were economically inactive. 20.1% of the population were under the age of 16 and 7.7% were aged 75 and over; the mean age of the people of the civil parish was 38.2. 69.9% of residents described their health as "good", similar to the average of 69.1% for the wider district. This twin gabled 15th-century timbered merchants house is now occupied by NatWest bank. Due to its exceptionally fertile soil, market gardening is carried out on a commercial scale in the surrounding area, known as the Vale of Evesham, which is known for its production of fruit and vegetables. A distinctive form of leasehold tenure, known as the Evesham Custom, still regulates market garden tenancies in the area. A decline in the second half of the 20th century resulted in the closing of Evesham's Smithfield Market while the Central Market stopped being used for produce auctions. Between 1983 and 2008, Evesham was home to computer manufacturer Evesham Micros, later renamed Evesham Technology. It was a significant contributor to the United Kingdom's domestic computer and digital television market. At its peak, the company employed up to 300 people with a chain of 19 retail stores in towns and cities throughout the UK. It went into liquidation in 2008. Retail and food outlets are provided for in the traditional high street and the Riverside Shopping Centre, and Four Pools Lane Retail Park. The Valley (formerly Evesham Country Park), is a large retail and leisure park located out of town with a diversity of stores, restaurants and cafés. In 1728 the London to Worcester road through Evesham was turnpiked as was the Evesham to Alcester road in 1778 improving communications in the area. Evesham is at the junction of the A46 and A44 trunk roads – the 4-mile (6 km) £7 million, A46 single-carriageway bypass to the east of the town opened in July 1987 as the A435. The River Avon is a navigable waterway linking the River Severn at Tewkesbury to the Stratford-upon-Avon Canal at Stratford-upon-Avon. The river between the town and Stratford is managed by the Upper Avon Navigation Trust, and below by the Lower Avon Navigation Trust, reflecting the administration of the river since the Restoration, when the lower Avon required only modest repairs, but significant investment was required above the town. The ancient Hampton Ferry links the town to Hampton. In 1845 an Act of parliament was passed for the Oxford, Worcester and Wolverhampton Railway and Evesham railway station opened between Honeybourne and Pershore. The station is on the Cotswold Line from Oxford to Worcester, Great Malvern and Hereford. There are trains every 45–55 minutes to London Paddington that take approximately 1 hour 45 minutes and trains to Birmingham take around 90 minutes (changing at Worcester). The nearest major airport is Birmingham International about 40 minutes away by trunk roads and the M42 motorway. Gloucestershire Airport at Staverton is a general aviation airport used for pilot training, private charter and scheduled flights to Jersey and the Isle of Man. Work began in September 2013 to replace the Abbey Bridge and was completed in March 2014. Schools in Evesham follow the three-tier education model of first school (ages 5–10), middle school (ages 10–13), and high school (ages 13–18) adopted by Wychavon District Council 1974 and completed by 1977. Twelve first (primary) schools which include state non-denominational schools as well as Church of England Bengeworth Academy and Roman Catholic school feed four middle schools which in turn send their pupils to complete their secondary education at The De Montfort School and Prince Henry's High School which originated as a grammar school established by the monastery and was re-founded by Henry VIII after the Dissolution. The Vale of Evesham School, operated by Worcestershire County Council, caters for children from the area aged 2 – 19 with special needs, and learning disabilities. Further education is provided by Evesham College, part of the Warwickshire College Group following the merger with South Worcestershire College (previously known as Evesham and Malvern Hills College) which caters mainly for students studying at the NVQ and BTEC level or undertaking practical vocational courses. The nearest higher education providers are the University of Worcester and the University of Gloucestershire. A University of the Third Age was established in 2003 and in 2010 had 600 members. It is possible that the 8th-century Anglo-Saxon Minster Church of Evesham Abbey was founded on the site of an even older church. The medieval town had two parish churches, All Saints and St Lawrence built within the abbey precinct. Religious establishments in Evesham include All Saints Church, Evesham Baptist Church, Evesham Evangelical Church, Evesham Methodist Church, St Andrew's C of E Church, St Mary & Saint Egwin's Church, St Peter's Church, Vale Of Evesham Christian Centre, the Unitarian Chapel in Oat Street and a Quaker meeting place. Evesham had a distinctive dialect, which locals called "Asum Grammar", or "Asum Grammer". The editor of the local newspaper quoted extracts from a fictitious dictionary of the language. In 1891, a glossary was published of words and phrases in South-East Worcestershire, comprising the district around Evesham and Pershore. This publication itself built on that of an 1882 author identified only as "Mrs Chamberlain". Prior to the 1882 book, little attention had been paid to the dialect of "the old Worcestershire folks", despite it being "interesting and peculiar". A decline in the dialect was already being noted, attributed at that time to standardisation of English schooling, something noted also by later writers on English dialects. The dialect continues to decline, but is stronger in older generations. More recent factors in its decline are attributed to changes in the market gardening scene, where the dialect was to be heard at its fullest, and the impact of television. In the local dialect, "Asum" is a contraction of the town's name. Asum was an ale produced by the now defunct Evesham Brewery. "Eve-shum" is the more common phonetic pronunciation, but "Eve-uh-shum" is not uncommon. Evesham Arts Centre was built in 1979 and is staffed and operated by volunteers. It provides a venue for professional and amateur performance. Events hosted include drama, stand-up comedy, brass bands, orchestras, pantomime to ballet. The centre has a raked 300-seat auditorium, full technical facilities and film projection and a 60-seat studio space for smaller productions. The centre's foyer it is an exhibition space for local artists. The centre is managed by the Evesham Arts Association, a registered charity. The Regal Cinema reopened in December 2009. Its Grade II listed building was designed in 1932 by architect Hurley Robinson. who was responsible for several public buildings in classical and Art Deco styles, including 55 other cinemas. The Regal is the most important surviving example. In 2009 the cinema signed a contract to show all Universal Studios films. It also serves as a community arts centre, offering a programme of music and stand-up comedy. Medieval Evesham, and the Earl of Evesham, inspired a novel Winning His Spurs by historical fiction author G. A. Henty. A more recent novel by M.C. Beaton entitled Agatha Raisin and the Wizard of Evesham, takes place largely in Evesham, and two of the main characters visit the local sights, with descriptions. Local folklore is provided for by the Legend of Evesham surrounding the life of Eof, an 8th-century swineherd credited with the founding of the town, and St Egwin the Bishop of Worcester who founded the abbey and who whose feet had been fettered and the key thrown in the River Avon. According to the legend, the key turned up in Rome inside a fish. On returning to Evesham, Egwin declared that a monastery be built on the spot where the key had been cast in the river. A major landmark is the statue of Eof by the sculptor John McKenna that was funded by the townsfolk and unveiled in the market place in June 2008. The Evesham Library, managed by Worcestershire Libraries & Learning division of Worcestershire County Council, is located in the town centre and was completely modernised following a closure for refurbishment in January 2011. It offers community services that include an online catalogue, Wi-Fi internet access, public internet terminals, and a mobile library. A local museum opened in 1957 and is funded by the council, The Almonry Museum and Heritage Centre, and the Tourist Information Centre are housed in a 14th-century half timbered building that was the home of the almoner of Evesham Abbey. Exhibits include many items of local interest including an exhibition themed on the battle of Evesham. Evesham has a 97-bed community hospital in Waterside, outside the town centre, used mainly by the elderly and for convalescence, although consultants from major Worcester NHS hospitals hold clinics there. The hospital maintains a Minor Injuries Unit (open from 9 am to 9 pm 7 days a week). The town has three health centres providing general practitioner first care services, and a dental centre. Evesham also has several nursing and retirement homes for the care of senior citizens. The Evesham area is covered by the Midlands Air Ambulance service, which has operated from the site of Strensham motorway services since 1991. Evesham local news has been served since 1860 by the Evesham Journal, now part of the Newsquest (Midlands South) Ltd. subsidiary of Gannett Corporation, which is predominantly a weekly free newspaper that is distributed over four counties. In 2007 the weekly free newspaper Evesham Observer was launched by Midlands-based Observer-Standard series of newspapers, now the family-owned Bullivant Media. Commercial radio stations that provide music and local news include Wyvern (radio) broadcasting on 96.7 FM, Touch FM broadcasting on 102 FM, and BBC Hereford & Worcester broadcasting on 104 FM and 94.7 FM. The Evesham Leisure Centre comprises two swimming pools, a climbing wall, a 100-station fitness room to our health and a beauty salon. Sport in Evesham is represented by Evesham United F.C. which plays in the Southern Football League Division One South & West, and Rugby Union – Senior and Youth Sections at Evesham Rugby Club. There is also a cricket ground. The town also has a pétanque team, and a cycling club, Evesham & District Wheelers, which was founded in 1947. Because of its situation on the river, the town is home to various watersports including Evesham Rowing Club, Kayaking & Canoeing provided by the Evesham Paddle Monsters club, and Evesham Sailing Club. The town includes two golf courses, Evesham Golf Club, which is situated outside Fladbury, and Twyford Golf Club, which is situated just outside Lenchwick. Evesham Vale Running Club hold the Evesham Vale 10K Race event very year. Alfred John Agg, Australian colonial public servant and commissioner of railways in Victoria. John Aldridge, a professional English and international cricketer who also played for Worcestershire. Born in Evesham in 1935. Ariel Bender, guitarist for Mott the Hoople and Spooky Tooth, was born and raised in Evesham. Molly Badham who was awarded the MBE was a co-founder of Twycross Zoo. She trained the chimpanzees who appeared on the famous Brooke Bond PG Tips TV ads for tea. Born in Evesham in 1914. Jim Capaldi, songwriter and founding member of Traffic was born and raised in Evesham. Muzio Clementi was a celebrated classical composer, pianist, pedagogue, conductor, music publisher, and piano manufacturer. He spent his final years in Evesham where he died in 1832. Simon de Montfort, leader of The Barons War against the Crown, died at the Battle of Evesham, and is buried in the town. Daniel Flynn, the actor who plays Superintendent John Heaton in the long-running ITV1 police drama The Bill was born in Evesham in 1961 but whose family moved to Bromley, Kent when an infant. Sir Henry Fowler, Chief Mechanical Engineer of the Midland Railway and subsequently the London, Midland and Scottish Railway was born in Evesham, on 29 July 1870. Edmund Hort New, was an artist who was born and grew up in Evesham in 1871. In 1905, he moved to Oxford where he began work on a series of drawings of the University of Oxford colleges, a project which occupied him for the rest of his life. Harry King (1886–1968) was a professional English footballer who was born in Northampton, and began his career at Evesham Star F.C..
Robert Lanchbury, is a former English cricketer who played first-class cricket for Gloucestershire and Worcestershire in the early 1970s. Born in Evesham in 1950. Alistair McGowan, impressionist and actor. Born in Evesham on 24 November 1964. Andy Preece, a part-time professional English footballer and manager. He began his career as a junior with Worcester City. He subsequently played for Evesham United. Born in Evesham in 1967. P J Proby (American pop singer) lives in Evesham. John Watson was born in Evesham around 1491 and was a Bishop of Winchester, and a Chancellor of St Pauls Cathedral, London. Today's Evesham Hotel is a Tudor mansion he built as the family home. William Jones, (1839–1913) was awarded the Victoria Cross for bravery at Rorke's Drift, the highest military award that can be awarded to British and Commonwealth citizens. Born in Evesham c1839. Guy Whittingham is a retired professional footballer with over 450 appearances for a number of English clubs including Premier League Aston Villa and Sheffield Wednesday. Born in Evesham in 1964. Evesham Township, New Jersey, USA. ^ "Welcome to the Almonry Website". Almonry Museum and Heritage Centre. Retrieved 17 January 2011. ^ a b Page, William; Willis-Bund, J. W., eds. (1971). Houses of Benedictine monks: Abbey of Evesham. Victoria County History, Worcestershire. 2. London, UK. pp. 112–127. Retrieved 26 September 2010. ^ "West Midlands: Wychavon". Heritage at Risk (PDF). English Heritage. 2010. p. 73. Retrieved 9 January 2011. ^ "Battle of Evesham, 4th August 1265". The Battlefields Trust. Retrieved 29 July 2009. ^ Prestwich (2005), p. 121. ^ "English heritage". National Monuments record. Archived from the original on 10 March 2012. Retrieved 7 October 2010. ^ Dugdale, William; Caley, John; Ellis, Sir Henry; Bandinel, Bulkeley (1819). "Evesham Abbey in Worcestershire". Monasticon anglicanum: a history of the abbies and other monasteries. 2. p. 4. Retrieved 18 January 2011. ^ "Evesham Town Council". Archived from the original on 13 August 2010. Retrieved 7 October 2010. ^ "MSN Weather UK - Today's UK weather forecast and world weather". weather.uk.msn.com. Retrieved 31 March 2018. ^ "Evesham History". Evesham Town Council. Retrieved 21 February 2010. ^ "Evesham". Environment Agency. 17 December 2009. Archived from the original on 1 October 2009. Retrieved 21 February 2010. ^ "Evesham Parish Profile - Headcount". Office for National Statistics. Retrieved 21 February 2010. ^ a b "Evesham Parish Profile - Work and Qualifications". Office for National Statistics. Retrieved 21 February 2010. ^ "Wychavon: Qualifications". Office for National Statistics. Retrieved 21 February 2010. ^ "Evesham Parish Profile - People". Office for National Statistics. Retrieved 21 February 2010. ^ Fiveash, Kelly (11 February 2009). "Evesham Technology confirmed dead". Channel Register. Retrieved 30 July 2009. ^ "The Valley Evesham". The Valley Evesham. Retrieved 18 April 2019. ^ "Aldington: Evesham Bypass A46". Badsey.net. 25 October 2006. Retrieved 29 July 2009. ^ J. Davies, Shakespeare's Avon: the history of a navigation (Oakwood Press, 1996), 25-9. ^ "Bridge reopens after work delays". 10 March 2014. Retrieved 31 March 2018 – via www.bbc.co.uk. ^ "New Chapter Opens as Colleges Merge". Worcester News. 1 September 2000. Archived from the original on 11 March 2007. Retrieved 29 July 2009. ^ "South Worcestershire College merges with Warwickshire College Group". Midlands Business News. Midlands Business News. 3 August 2016. Retrieved 8 October 2016. ^ "Evesham and District U3A". Archived from the original on 26 November 2010. Retrieved 7 October 2010. ^ a b c "Asum grammar". Badsey. 7 May 2006. Retrieved 29 July 2009. ^ a b "Life in Evesham". Evesham Town Council. Retrieved 10 January 2011. ^ "Evesham Arts centre". Retrieved 3 October 2010. ^ "505575 - Evesham Arts Association". Charity Commission. Retrieved 21 February 2010. ^ "Regal Sign Deal with Universal". Evesham Journal. Retrieved 4 December 2009. ^ "Evesham Regal Trust". Archived from the original on 11 March 2006. Retrieved 7 October 2010. ^ a b "British Listed Buildings, Evesham". Retrieved 7 October 2010. ^ "The Regal Events". Archived from the original on 17 September 2010. Retrieved 3 October 2010. ^ "Press Clippings". Archived from the original on 17 February 2011. Retrieved 3 October 2010. ^ Henty, G. A. (2008). Winning His Spurs. BiblioBazaar. ISBN 978-1-60424-597-4. ^ "The Statue of Eof - the Legend of Evesham". Evesham Town Council. Archived from the original on 23 December 2010. Retrieved 17 January 2011. ^ "Evesham Library". Worcestershire County Council. Archived from the original on 30 December 2010. Retrieved 17 January 2011. ^ "The Almonry Museum". Evesham Town Council. Retrieved 17 January 2011. ^ "Minor Injuries Units". NHS Worcester Health and Care. Retrieved 11 January 2018. ^ "Ambulance lands a new base - on the M5". Birmingham Evening Mail. Trinity Mirror Midlands Limited. 6 May 1998. ^ "Evesham Journal". Newsquest (Midlands South) Ltd. Retrieved 3 October 2010. ^ "Evesham Observer". Bullivant Media Ltd. Retrieved 11 January 2011. ^ "Evesham Leisure Centre". Wychavon Leisure Community Association Ltd. Archived from the original on 20 February 2011. Retrieved 17 January 2011. ^ "Evesham Pétanque Club". Retrieved 9 August 2015. ^ "Evesham & District Wheelers – Founded 1947". Retrieved 18 April 2019. ^ "Evesham Vale Running Club". Evesham Vale Running Club. Archived from the original on 7 March 2014. Retrieved 7 March 2014. ^ "Cricket Archive". Cricket Archive. 31 March 1935. Retrieved 29 July 2009. ^ "Molly Badham - Obituaries, News". The Independent. 26 October 2007. Retrieved 29 July 2009. ^ "Sir Henry Fowler". Steamindex.com. 6 January 2010. Retrieved 21 February 2010. ^ "Robert Lanchbury". Cricinfo.com. Retrieved 29 July 2009. ^ "Alistair McGowan". Internet Movie Database. Retrieved 21 February 2010. ^ "Andy Preece". The Internet Soccer Database. Archived from the original on 2 October 2008. Retrieved 29 July 2009. ^ "PJ Proby: Could the now-penniless singer be ready for a comeback?". The Independent. 30 September 2007. Retrieved 29 July 2009. ^ "PJ Proby In £50k Fraud Inquiry". Daily Record. 18 February 2008. Retrieved 29 July 2009. ^ "Edward Righton". Cricinfo.com. Retrieved 29 July 2009. ^ "Guy Whittingham's Biography - UpThePosh! The Peterborough United Database". Uptheposh.com. 10 November 1964. Retrieved 29 July 2009. ^ "Rio Olympics 2016: Great Britain win gold in men's four". 12 August 2016. Retrieved 18 April 2019. ^ "Life in Evesham". Evesham Town Council. Retrieved 27 September 2010. English Heritage (1995). English Heritage Battlefield Report: Evesham 1265. Wikimedia Commons has media related to Evesham. Wikivoyage has a travel guide for Evesham.